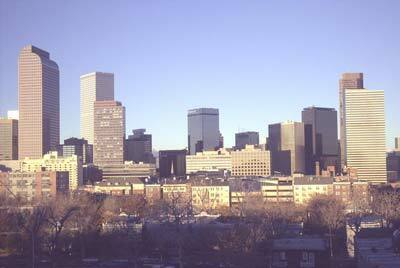 The City and County of Denver is the largest city and capital of the state of Colorado, United States of America. It is the largest city along the Front Range and forms the heart of the Denver-Aurora metropolitan area. The city is located on the plains just east of the foothills of the Rocky Mountains, which form a dramatic and awe inspiring skyline to the west. The central downtown district is on the east side of the South Platte River, near its confluence with Cherry Creek, approximately fifteen miles from the foothills. The population of the city is 554,636. The population of the Denver-Aurora metropolitan area is 2,179,240. Denver is nicknamed the "Mile-High City", because its official elevation, measured on one of the steps on the state capitol, is 5,280 feet (1,609 m) above sea level. Also, a row of seats in the upper deck of Coors Field, home of Major League Baseball's Colorado Rockies (NL), is distinctively marked in purple (one of the team's colors) to indicate that the row is one mile above sea level. Denver has also been known historically as the Queen City of the Plains because of its important role in the agricultural industry of the plains regions along the foothills of the Front Range. Denver's economy is to some degree based on its geographic position and its connection to some of the major transportation systems of the country. Since Denver is the largest city within 600 miles, it has become a natural location for storage and distribution of goods and services to the mountain west. Denver is also approximately halfway between the large cities of the midwest like Chicago and St. Louis and the cities of the West Coast, another benefit for distrubution. This position also allows Denver to have a considerable amount of federal jobs with many federal agencies based or having offices in the Denver area. Denver's west-central geographic location in the Mountain Time Zone (UTC -7) also benefits the telecommunications industry by allowing communication with both North American coasts, South America, Europe, and Asia in the same business day. Denver's position near the mineral-rich Rocky Mountains, encouraged mining and energy companies to spring up in the area. In the early days of the city, gold and silver booms and busts played a large role in the economic success of the city. In the 1970s and early '80s, the energy crisis in America created an energy boom in Denver captured in the soap opera Dynasty. During this time, Denver was built up considerably, with many new downtown skyscrapers built during this time. Denver International Airport (DEN) is located 40km (24mi) northeast of downtown. The downtown Denver Bus Terminal is immediately north of the capitol; trains converge on neoclassical Union Station at the northwestern edge of the downtown grid. The non-navigable South Platte River flows just north of downtown and is lined by trails and roads that snake into the mountains to the southwest. Colfax Ave (Hwy 40), one of the longest streets in the USA, bisects the city on its 65km (40mi) journey from Strasburg to Golden. Famous Denverites are Tim Allen, Phillip Bailey - R&B lead singer with Earth, Wind & Fire, later made pop tunes with Phil Collins among others, graduated from Manual High School, Chauncey Billups, Richard Butler (born in Bennett, Colorado), David Fincher, Pat Hingle, John Kerry (born at Fitzsimons Army Hospital in Aurora, Denver's eastern neighbor), Joseph C. Phillips Actor and political commentator, Dean Reed, Karl Rove, Alan K. Simpson, Paul Whiteman. Famous non-native residents are Neal Cassady - the beat generation icon was born in Salt Lake City, Utah, but was raised in Denver, Don Cheadle - born in Kansas City, Missouri, graduated from East High School, Judy Collins - folk singer, born in Seattle, Washington, graduated from East High School, Madhuri Dixit - Indian actress married to Dr. Sriram Nene, a heart surgeon, born in Bombay, India, John Elway - Hall of Fame quarterback for the Denver Broncos, 1983 - 1998 NFL seasons (including the Super Bowl played in 1999), Pam Grier - born in Winston-Salem, North Carolina, graduated from East High School, Hattie McDaniel - First African-American to win Academy Award for Gone With the Wind, born in Wichita, Kansas and raised in Denver, Golda Meir - Former Prime Minister of Israel, lived in Denver for a time as a teenager, her house is preserved as part of the Metropolitan State College of Denver campus, Pat Oliphant - editorial cartoonist, born in Adelaide, Australia, Dianne Reeves - Jazz vocalist, graduated from East High School.